On May 1940, the Panzers crossed the Meuse river. Guderian had the choice to go south and attack the rears of the Maginot line or to head west in order to encircle the French troops holding the Meuse line. The town of Stonne and the woody hills of Mont-Dieu were the single area where it was possible to try to stop the German advance. To attack the Germans, the French urged elements from the 3rd DIM, from the 3rd DRC and the 4th BCC, to face elements of the 10.PzDivision and of the Grossdeutschland infantry Regiment. Stonne saw very hard fighting, the town itself switched sides 17 times in 3 days. Some German officers mentioned Stonne among the battles they will never forget. Most of the Grossdeutschland infantry regiment of the 1940 western campaign were lost in Stonne. The town was totally occupied only on May 25, French pockets were still resisting to the enemy. The French infantry lost many men too: one of the 51 e RI company finished the battle with only five sergeants and 30 soldiers. 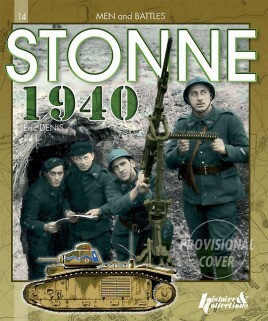 The battle of Stonne has be called by the Germans the 'Verdun of 1940'. A well written and very readable account, which tells a slightly different view of the fall of France in 194, and that it wasn't just a walk over for the invading Wehrmacht.